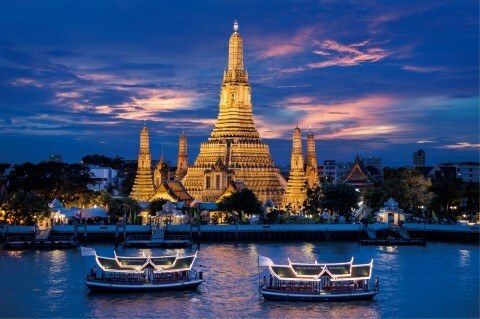 Seattle is showing some pretty cheap flights to Bangkok, Thailand with the Star Alliance airlines for $590 CAD roundtrip including taxes. The flights connect in Vancouver each way, so you can theoretically depart from Seattle on your way to Thailand, yet disembark from Vancouver on your way home. But remember that checked luggage would still end up in Seattle. The flights use a combination of Air Canada, with either ANA or Cathay Pacific. The price on the Air Canada website will be in $USD. flight deals, seattle, sea, asia, bangkok, thailand, bkk and southeast asia. 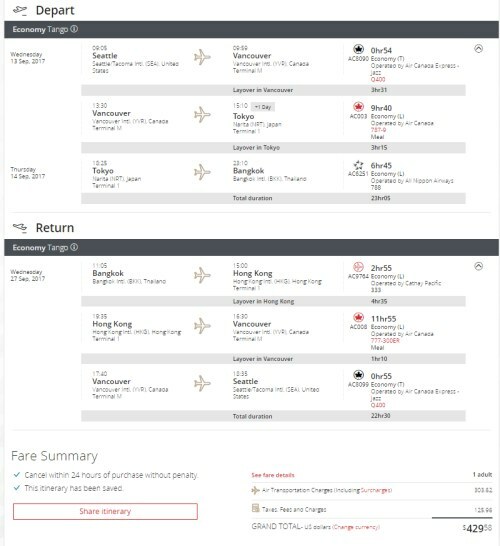 4 Responses to "Seattle to Bangkok, Thailand - $590 CAD roundtrip including taxes"
Assuming you're not checking in any luggage, can you do an online checkin and get your boarding pass from YVR to Tokyo online and board at YVR? Would that work? Unfortunately not. All airlines automatically cancel the remainder of your ticket, once you intentionally miss a leg of the journey. They would view it as you intentionally missing the Seattle - Vancouver leg, and then the remainder of the ticket would be cancelled. For the last leg of Vancouver --> Seattle on the return trip, there's nothing preventing us from NOT taking that flight, right? Have put in a few 2-week travel date combos both in Aug-Sept and 2 Weeks in Nov, but still cannot find a flight or date combo at $590 CDN. I keep getting about $964 USD. Any tips?